How does Game of Thrones manage to juggle so many characters and such convoluted plots in a way that makes sense but without losing complexity and whilst furthering the narrative? One of the ways is by keeping the structure simple, breaking it up into distinct but linked sections, ensuring that each picks up logically from where the last one left off, and building into at least each of the larger units a question for the viewer that incites a desire for an answer that will have to wait for later, usually the next episode. The fourth episode, Sons of the Harpy, was 50m21s long. I had assumed all episodes were the exact same length but I now see that they’re not; the previous episode, High Sparrow was 59m50s, the next one, Kill the Boy, will be 56m37s. In this one, the narrative proper begins 1m53s into the episode, after the celebrated opening credits, and ends at 48m59s, before the closing ones. Episode Three ended with the kidnapping of Tyrion Lannister (Peter Dinklage) leaving us unsure as to whom did it and why. The fourth episode begins by providing an answer: it’s Jorah Mormont (Iain Glen) and his aim will become clearer later on. 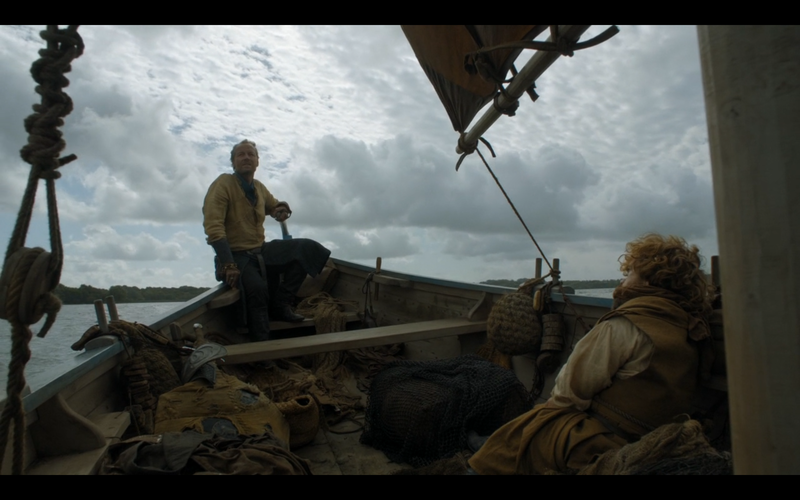 This sequence lasts just over a minute and at 2.57, whilst one brother is being moved on a barge in one direction, the other, Jamie Lannister (Nicolaj Coster-Waldeau) is on a boat headed to Dorne to bring his daughter/niece back home to King’s Landing without causing war between Westeros and Dorne. 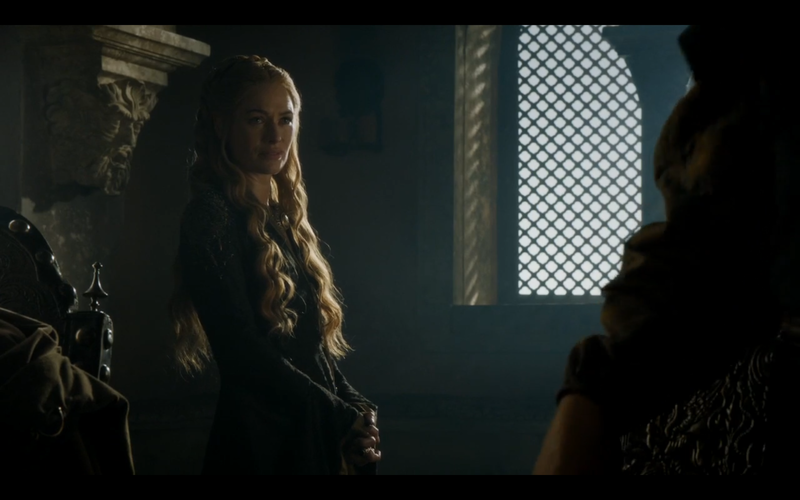 This segment is also very brief and 5m47s into the episode, we’re with Cersei Lannister, the mother of Jamie Lannister’s daughter/niece Myrcella (Aimee Richardson), where we will linger for about ten minutes until 15m48 seconds into the narrative. What one can extract from this is that one of the things that links the first three episodes is that they all revolve around the Lannister siblings. 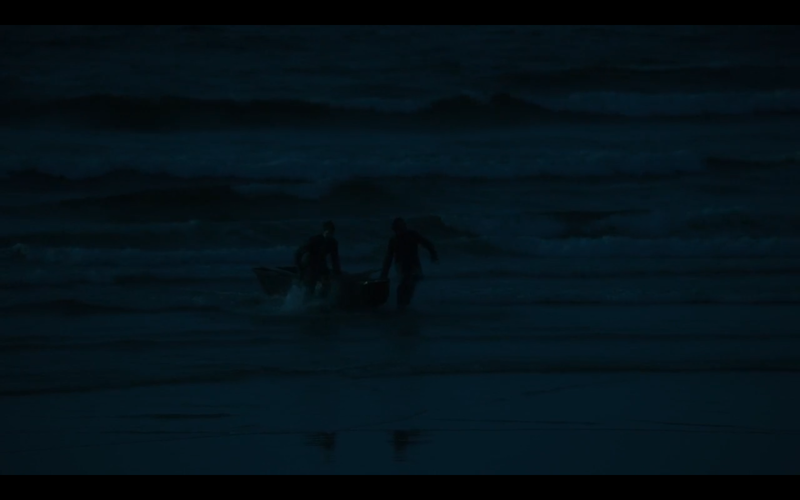 There are also further connections: Tyrion has been kidnapped after Jamie freed him; thus Tyrion is free only to be kidnapped; in Jamie’s segment, the second one, Jamie promises to split Tyrion’s head in two should he run into him; visually they are linked by boats and water (see figs a & b above). In turn, Jamie and Cersei are linked by their daughter, Myrcella, whom Cersei has commanded Jamie to bring home and is the reason for Jamie’s voyage; visually we’re shown them in the same glowing honey-brown palette (see fig.1 and fig. 2 below). This all raises interesting questions Raymond Bellour once posed in relation to cinema: how to categorise for analysis? What is a segment? What is a sequence? What is a scene? I won’t presume to try and answer those questions here but will merely indicate that, if one takes unity of character, place and action as foundational criteria, then one would take what I’ve just described above as three different scenes. But if one takes it to a different level of generalisation, one can argue that the episode has just spent the first 15 minutes on the Lannisters and then goes on to spend another 15 minutes on the house of Stark (from 15m48 on Jon Snow and Castle Black and from 25min to 30m16 on Sansa Stark at Winterfell) which has it’s own kind of balance. The standard unit seems to be of about ten minutes and this episode has four such units: Cersei’s at King’s Landing, Jon Snow at Castle Black, later Jamie Lannister’s story line at Dorne and finally the episode with Daenerys Targaryen (Emilia Clarke) with the rest of the smaller units used as a narrative thread, as rhyming and echoing devices, as comparison or counterpoint to what leads or follows from it, and sometimes simply as a reminder that these other stories are still in process, still at play and will be returned to with an accretion of events and meaning and rendered more complex and richer. Fig. 3 Striking side-lighting as characteristic stylistic device. What I found fascinating about each of the ten minute slots is that they offer a staggering amount of plot, most typically conveyed via dialogue and in medium close-up and with striking side-lighting as a characteristic stylistic device (see fig. 3 above) . 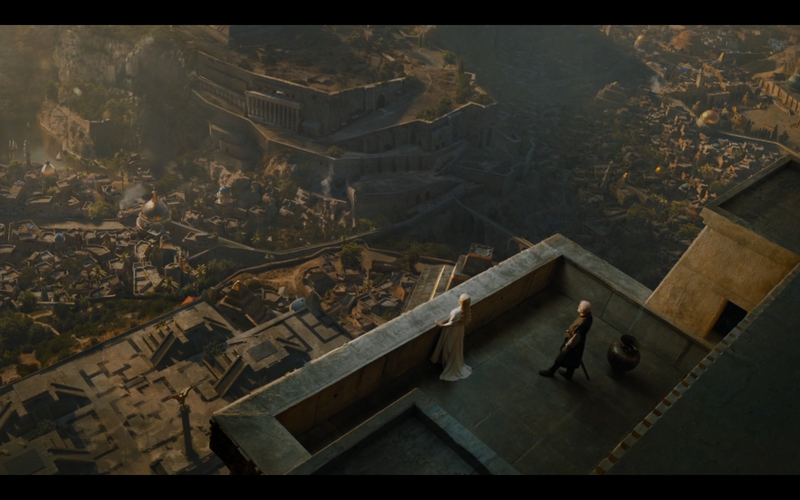 Thus, in the first segment with Cersei, she ships her daughter-in-law’s father off to Braavos, solidifies her power by making her council as small as possible, resuscitates the Faith Militant — a military religious order previously extinct for two hundred years — and arms them, makes High Sparrow (Jonathan Pryce) High Septon, they get so powerful they arrest the brother of the queen and block entrance to the king himself. The new Faith Militant go on a bloody rampage, raiding brothels and killing deviants and infidels like a new Inquisition. This is only scratching the surface of the plot of this ten minute section; it goes on even further and in more convoluted ways, like a ‘30s Warners film; and like a ‘30s Warners film everything is elegant, spare, understandable, necessary; you get told exactly what you need to know and it all makes sense. And this can be seen as a particular accomplishment since some of the characters have been given names that are equivalent to those in Russian novels — so difficult to remember and write. I also find it hard to keep track of the story, not a problem when viewing, a particular accomplishment of the televisual story-telling — but becomes one when trying to remember, analyse and write here. Mind you, I read the novels when they came out and had forgotten pretty much everything by the time I got to see the show. So keeping all the narrative elements in play, focused, and clear and easy to follow whilst viewing is but one of the particular triumphs of this series. I also found it interesting that within each of the roughly ten minute sections, the focus of the narrative often moves away from the central protagonist. 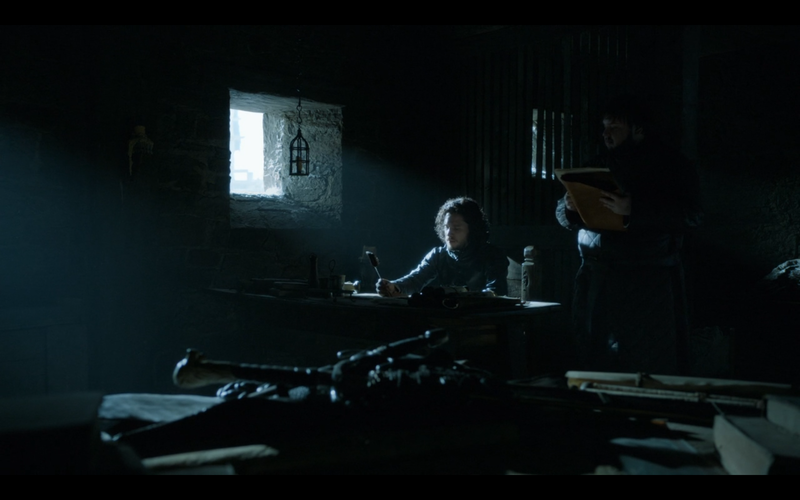 Thus the section on Jon Snow and Castle Black moves from Jon Snow, his concerns, and Melisandre’s attempt to seduce him into supporting Stannis Baratheon’s crusade against the Boltons, and puts the focus on Stannis’ daughter, her disfigurement, her mother’s guilt at only having borne her husband a daughter — and such a disfigured one! — the daughter’s concern that her father doesn’t love her as a result, and the father’s complete reassurance of his love; something that will have such repercussions later on in the series. 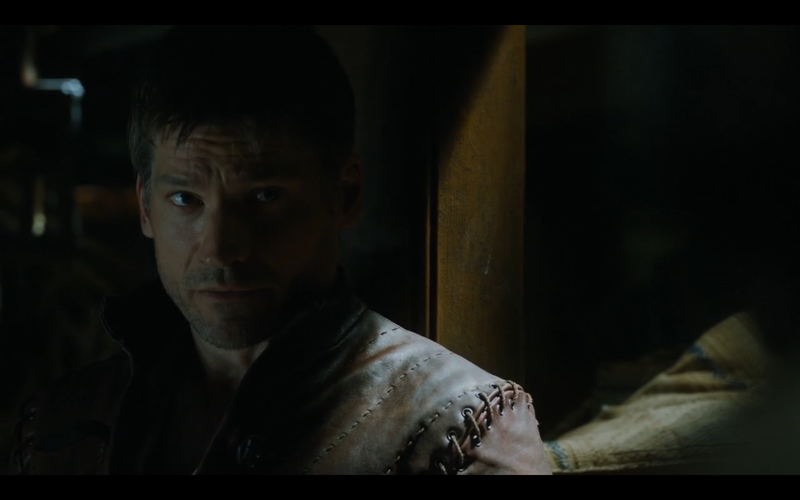 This moving the narrative focus from the principal character in the section onto others so that supporting characters – their desires, motivations and actions – are put into focus is also to be found in the section on Jamie Lannister that begins at 30m16 and ends at 39 min; and also on the section on Daenerys which begins at 42.28 and ends at 48m59s. Fig. 4 – A few elements, artfully composed. The episode is also structured around rhyming sequences, thus the spectacular violence of the Faith Militant in the first 15 minutes of the show is echoed in the spectacular violence of the Sons of the Harpy. There are also other rhymings: Like I discussed in relation to the first episode, the image is kept relatively simple with the eye drawn at most to a few elements see figure four above) or a clear arrangement of a handful of elements to be rendered not only delightful but legible on a smaller screen, even when in complex and spectacular shots (see fig. 5)); the use of change of focus that I described as so elegant and meaningful in Episode Three is also used here (this episode is also directed by Mark Mylod) but I found it a bit coarser, too obviously underlining what didn’t need to be (see clip below). Lastly the type of sweeping spectacular reveal that I discussed in Episode Two is also evident throughout this episode, but most interestingly in the last shot, which like the last segment in the previous episode poses questions that will be answered in the next one. ‘Cliffhanger’ endings seem to be typical of the series. Thus, to summarise, in spite of the complex plot, the array of characters, the obscure names and convoluted array of kinship and alliances, the episode is made easily understandable by being kept simple with the main sections kept at approximately ten minutes each, generally with four sections per episode, but threaded through with smaller ones that echo, or rhyme with previous ones but that also help set the context for the subsequent one; there is a logical order to the episodes both thematically (clans) and also stylistically (use of colour or rhyming contexts); there is also a clear but melodramatic conveyance of plot with cliffhangers from episode to episode, usually through dialogue and in close-up. 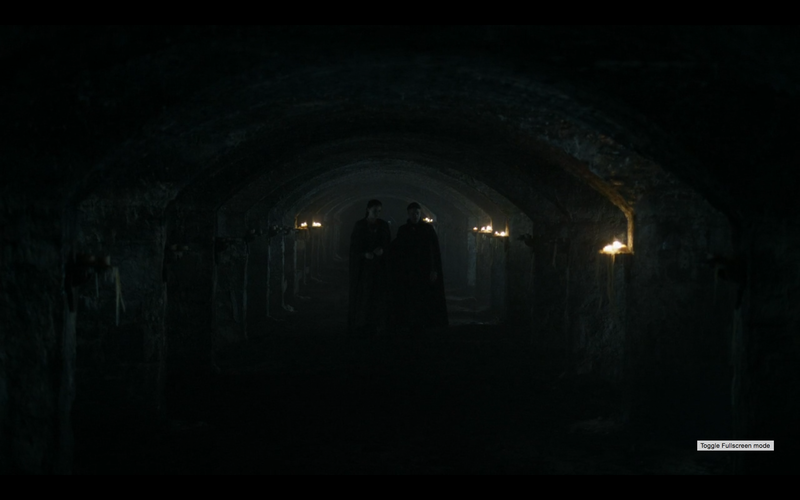 The episodes are tied together through familial relationships, or through editing on lighting or objects (see, for example, how the candle in front of Stannis Barathean motivates the cut at 25m to the episode with Sansa). The complex plot is also made manageable through a consistent use of stylistic devices within each episode and from episode to episode in spite of the different directors that work on each. I’m sure there will be more thoughts, shorter, and clearer, once I’ve thought this all through a bit more. But the main message is obviously that there are a lot of complex structural factors that go into making the storytelling in Game of Thrones so clear, elegant and satisfying. Great post as usual. As I understand it, in US TV writer’s rooms – probably elsewhere as well – those little segments of narrative are called ‘beats’. One of the major differences between storytelling on cable versus network is the arrangement of ‘beats’, because network has to accommodate commercials, but cable (well, HBO) doesn’t. Linda Williams talks about it a little in ‘On the Wire’ if memory serves. Soap opera writers are also pretty adept and economical at managing those specific bits of story within much longer arcs. How do they compare, do you think? Good point Hannah, thanks. I should have mentioned beats as well, though my understanding is that that’s more specific, e.g. ‘Cersei walks across the room and slaps Jamie’ is my uderstanding of a beat (though I”m not too knowledgeable on this) and how this compares with soap opera is very interesting to speculate on (and I might get to it when and if I write on Empire, which I’m loving at the moment and which would lend itself brilliantly to such a comparison).